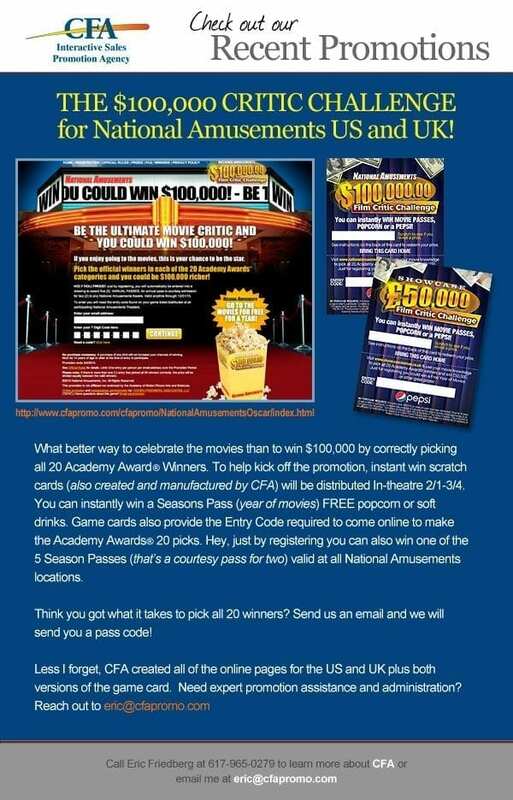 Another satisfied client of CFA is National Amusements with their $100k Critic Challenge. In 2010, CFA put together a sweepstakes that awarded specific prizes to residents of particular states who were at least 14 years old. The event created a substantial increase of National Amusements popularity, in addition to giving away some fantastic prizes. But, what do you expect when a top-notch sweepstakes management company organizes and administers your event? Participation in the National Amusements $100k Film Critic Challenge was open to citizens of MA, NY, PA, NH, CT, or, RI. Legal residents were required to be at least 14 years old when they entered. The challenge began at 12:01 am ET on Monday, February 1st of 2010. The sweepstakes closed at 11:59 pm ET on Thursday, March 4th, 2010. Entrants could enter to win the prizes during these dates and times. Only one entry was allowed per person and email address. There was both a Grand Prize Sweepstakes and a Contest for the promotion. During the event period specified above, entrants visited National Amusements website (www.nationalamusements.com), clicked on the Promotions icon and followed instructions to complete and submit their online registration form. After that, all that was left to do was wait and dream about winning the grand prize. In total, there were two winners and an estimated ARV of $105,200. There were five sweepstakes grand prizes awarded. The reward consisted of an annual pass for a courtesy admission for two at any participating Nation Amusement theatre location. These prizes were estimated to value $1,040 for each one. The $100k Critic Challenge grand prize subsisted of one prize of $100,000 if the entrant correctly chose all twenty winners in the Academy Awards categories proposed during the contest. This sweepstakes and contest gave away over $100,000 in awards to two grand prize winners, while promoting their company. If you want to have sweepstakes, games, or other promotional events for your business, let the professionals at CFA manage and administer the contest. We have been in the contest administration business for over 20 years, and the successful events and client satisfaction speak for our abilities.